This morning, Warner Bros released the first Justice League trailer. I’ve watched it a few times now, and honestly, it looks fine. I don’t hate, but I don’t love it. I’m in between. Still excited for November 17 (the U.S. release date). I’ll probably try to go see it at midnight, but the trailer did not give me any new rush to see the movie. If you haven’t seen the trailer, please watch it before you continue on as I will be going into **Spoiler** territory. Okay. I’m not sold on Batfleck. I wasn’t sold on him in Batman V Superman and this trailer has not really given me any other reasons to like him. The first shots show him traveling across a glacier in Iceland (possibly the perfect location for these Synder-verse DC movies) to find Arthur/Aquaman. Looks very pretty, and saturated– great. Throughout the rest of the trailer we see Batman wrangling The Flash, talking with Diana, sitting in his bat mobiles. All cool shots, and his costume looks perfect, I just don’t have any emotion other than underwhelmed when he speaks. I can’t find a way to care about Batman. Sure, he has some quips, a broody stare, and cool toys/gadgets, but I don’t care. I really don’t care. My main problem with Batman V Superman was that there really wasn’t any character development in the movie. Yes, we learned things about Bruce’s past, and got to see how he interacts with the villains of Gotham, but I still don’t know this incarnation of Bruce Wayne. I honestly can’t distinguish him from Ben Affleck. I’m hoping this movie gives me more of a reason to care about Batman, but from this trailer I don’t think that is going to happen. We also see Commissioner Gordon in the trailer, for a hot second, and like, yay! Good for him to make it into the Justice League movie. Not exactly sure why he needed to be in it, but he is. The more the merrier, I guess? 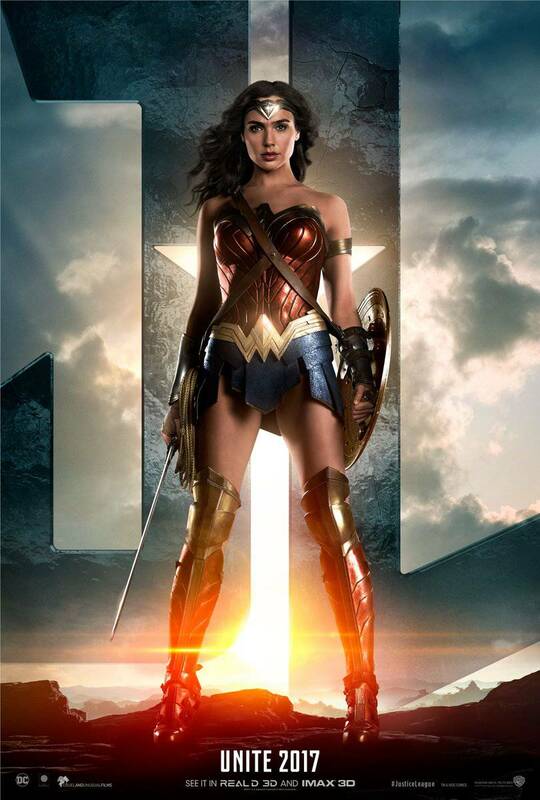 Ooooooh boy, I am so in love with Gal Gadot as Wonder Woman. She always seems so calm and collected. I’m very excited to see the stand alone Wonder Woman movie this summer, and am also interested to see her role in Justice League. Honestly, I hope she is more the leader than Batman. I want to see her cunning battle strategies she learned growing up with the other Amazonians come into play in this movie– especially since we see a scene in this trailer that reminds me of one of the many battles from The Lord of the Rings. Don’t get to see a lot of her in this trailer, but what we do see I like. She gets another cool kick-the-feet-out-from-under-the-badguy move. She looks beautiful. The costume moves so well on screen. I have no real qualms with her character, other than that I want MORE. She was under utilized in Batman V Superman, but unlike with Batman, I care about her. I don’t know if it is because Gal Gadot was an actor I hadn’t really seen before so I didn’t think I was seeing an actress on screen, but actually Wonder Woman– or the fact that I just like Wonder Woman so much more than Batman. 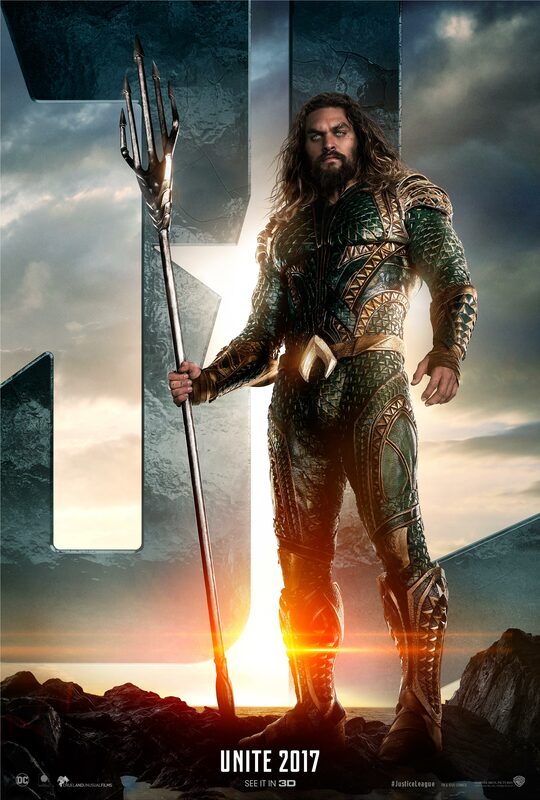 Hiring Jason Momoa to play Aquaman was the smartest decision Warner Bros has made regarding the DC super hero franchise. My least favorite thing about Aquaman in Smallville was that I hated him. He was just this Michael Phelps looking bro who really didn’t bring anything to the table. But, Jason Momoa as Aquaman? It’s honestly what made me originally so excited for this movie. Not only does Jason already look the part, the costume they built for him is so intricate and plays so well with the lighting that Snyder loves to use. He looks like he could just pick me up and rip me in half and I love it. I just hope we do get to see the humorous side of Jason Momoa and not just another version of Khal Drogo from Game of Thrones. Though, I wouldn’t really complain either way. Whatever Jason does I will like. From the trailer, it looks like he will have a humorous rapport with Batman and I can’t wait to see how he plays with The Flash, Cyborg, and Wonder Woman as well. It looks like he will be the character to watch in this movie. I also hope we get to see more than just stabbing-people-with-the-trident fight moves that we see in the trailer. There better be some water-bending or cool water fight. I don’t like the costume. I’ve tried so hard since they first released the images over a year ago, but I can’t lie anymore. The Flash looks so stupid– like one of those bendable action figures from the 90’s. It moves well on screen, and the lightning almost redeems it, but I don’t think they could do anything to make me like the costume. Other than hating his look, I like all of the other things we see about The Flash. Ezra Miller is a great actor, and I think he will bring a much needed lightness to the movie ( other than the fact that his dad is prison ). What I’m mainly excited for in this movie is to see how The Flash and Cyborg interact. They are the two ‘younger’ members of the League and I kind of want to see them act young. Let Batman, Wonder Woman, and Aquaman be the brooders, and let The Flash and Cyborg have a little fun. Doesn’t have to be some stupid montage of them getting drunk together or anything, but just a few smiles every now and then would be nice. All-in-all excited to see another version of Barry Allen. 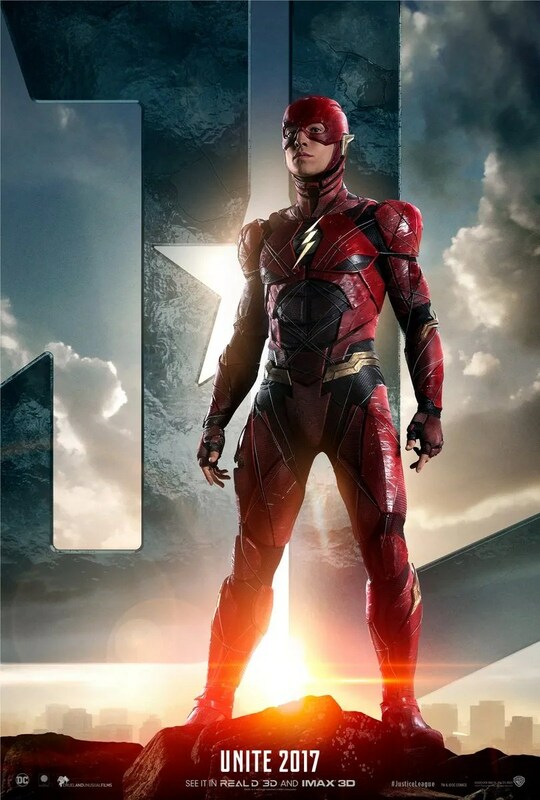 Really like the CW show, so I believe in Ezra Miller’s ability to make this version just as likeable. I don’t know how I feel about this character yet. The actor, Ray Fisher, is really excited about playing Cyborg, so that in turn makes me excited. His costume reminds me of a Jaeger from Pacifc Rim, though– which I don’t know if I like that. He definitely looks like a half-man half-robot, so yay? In the trailer we see him fly above the clouds, and flip over a burning car, which is cool. I just hope they give him a bit of the sense of humor he has in Teen Titans. Would just one “BOOYAH” be too much to ask? We only see Lois Lane for about a second in this trailer. She’s staring up into the sky, looking kind of forlorn– completely understandable as she just lost the love of her life, who just so happened to be Superman. I’d be pretty upset too. I decided to include her in this post because I think Lois will play a very important role in this film. Hopefully, it won’t be just as some means to resurrect Superman, or as a kidnap victim. I want her to be valuable to the League. I want to see her being every bit Lois Lane as she can be, whilst also dealing with the loss of Superman. Amy Adams is such a good actress and I feel like they haven’t utilized her enough yet. I think a Wonder Woman/Lois Lane team up would also be great. Now, the one thing I was both happy and sad not to see in this trailer was the lack of a mention of Superman. Because he is coming back. He’s coming back right? He has to come back. He’s Superman. My favorite super hero of all time and founding member of the Justice League. He HAS to come back. I was happy he wasn’t in this trailer though, as I want to be surprised. I don’t really want to know exactly how he is coming back. Leave that to the movie. I was also sad though, because I love Superman so much and always want to see him. Good trailer, not amazing, but it did get me back into anticipating the premiere of the movie. Glad to see any footage of Aquaman, and Wonder Woman. Just interested to see how this all plays out. Like the trailer? Hate it? Let me know all about your ideas/opinions in the comments!